Dancenorth delivers an intensely moving, lithe and at times visceral short work with Tectonic, touching on place, history, nature, colonialism, industrialisation, climate change and rising sea levels, on a site that underpins the premise spectacularly. Tectonic is presented in two parts. In the second, a traditional song and dance cycle by the Urab Dancers from tiny, slowly sinking Poruma Island in the Torres Strait introduces us to the friendly people at the heart of this increasingly universal story of impending catastrophe and potential displacement. Their presence, part of an ongoing collaboration with Dancenorth, renders Tectonic personal. Ancient patternings of rhythm and gesture echo back and forth between the two parts of the event. Townsville’s unique beach site slopes down to the water, overlooking the Coral Sea and Magnetic Island. 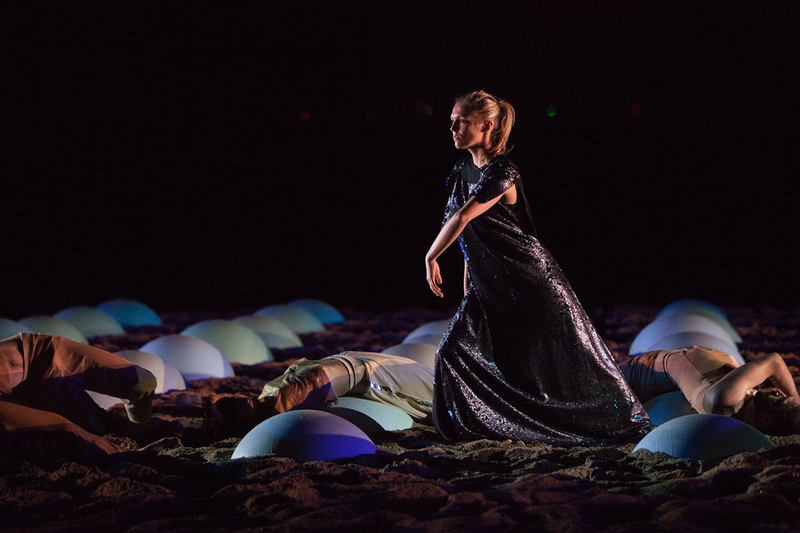 180 colour-coded fitballs are uniformly half buried in the sand to form an enormous grid delineating the performance area. Dramatic side lighting constantly changing the visual sense of depth and colour, the resonant soundtrack and a tropical night sky with a slight wind moving the palm fronds, all collude ethereally to focus the senses on the dance. At first, a figure in shimmering black and green, suggestive of elemental forces, stands near the tideline, her back to the action, imposing even at a distance. As the other six dancers, in loose flesh-coloured trousers and tops, enter the grid of balls, it becomes clear that there is a relationship between the far figure and the others, a kind of orchestration occurring via her gestures. At first this appears synergistic, the dancers bouncing on and flipping from the fitballs. As the figure (an imperious Samantha Hines) edges closer in barely perceptible increments, the mood darkens. Suggestions of fear, aggression, exploitation and sickness appear and the dark figure now seems invasive and polluting, a harbinger of industrialisation. Sand runs through the dancers’ fingers like time running out. They frantically bound across the fitballs, dive-bombing into the ground and rising up to repeat. The central figure begins to remotely and remorselessly lift and drop the others, allowing them to almost stand before a flick of her hand fells them, onto their backs, splayed over the balls, gradually moving them all the way back to the shoreline. Once on the far side of the grid, they strip and slowly disappear into the water and darkness. The work includes an outstanding duo by Ashley McLellan and Jenni Large, which is so close, intense, despairing and evocative of death that I’m anxious for the children nearby in the audience. The Dancenorth ensemble is fearless and expressive, and I see no flagging of energy between a show early in the run, and one at the end. The unhappy conclusion of the first half of the show is tempered by the cultural vitality presented by Urab Dancers in the second half. They continue to dance and sing even though the sea has advanced 30 metres in a decade to literally lap at the back doors of their homes. Their spirit suggests that if we act as a global village, we can work to reverse the havoc wrought by rampant industrialisation, everywhere. The public flocked to (and in some cases, stumbled upon) the free show’s twice-nightly sessions and milled along the foreshore, children on shoulders, smartphones recording the moment for social media. Dancenorth Artistic Director and Tectonic choreographer Kyle Page has taken public accessibility for contemporary dance to a new level, with a diverse audience of some 7,000 people engaging with the work on the Strand during its week-long run, part of the biennial sculpture project Strand Ephemera and coinciding with The Australian Festival of Chamber Music.